Your Voucher will be sent to you with in 1 working day via email (pdf format). Gift vouchers are not subject to any postal charge. - Voucher code - to be used in the checkout area on the troutcatcher website. - Voucher may be exchanged for goods at www.troutcatchers.co.uk one year from the date of issue. - It cannot be used for shipping costs - only goods. - It may not be exchanged for cash in whole or in part but may be used to make up the balance for goods of a higher value. 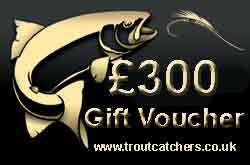 To use a voucher please visit www.troutcatchers.co.uk select the items required and enter the voucher number in the coupon code box on the shopping cart page. And continue the checkout process in the normal way.